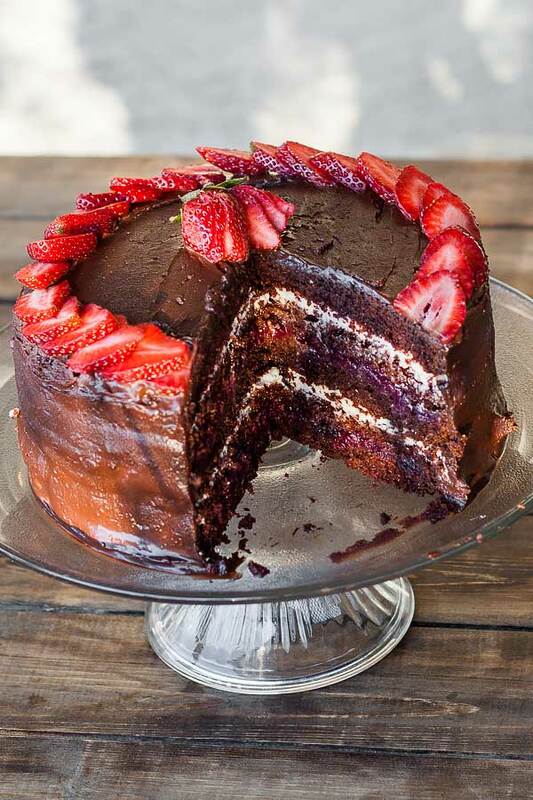 If you are into cakes and this type of dessert, than this is it, the ultimate fruit/berry chocolate cake. It is extremely refreshing and weird enough, not that sweet and those berries really bring up the chocolate flavor… but don’t trust me, give it a shot yourself. Now, you need two cake pans, 8 inches (20cm) in diameter, at least this is what I used. Butter the pan using some melted butter then cut out two parchment paper circles and fit on the bottom, inside. 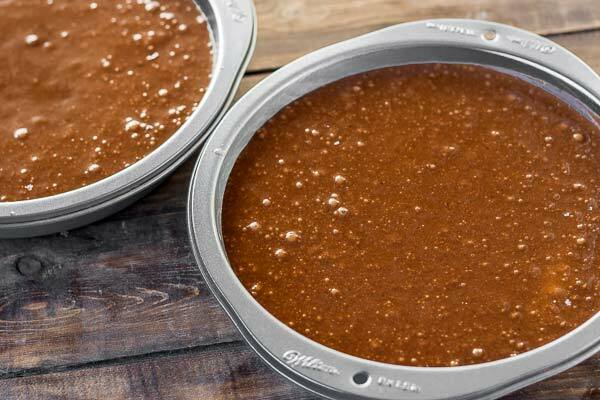 Preheat your oven to 350° F / 175° C while in the bowl of your mixer you vigorously swirl flour, sugar,cocoa, baking soda, baking powder and salt; use the paddle attachment and do it on slow speed until everything is well combined. In a medium size bowl, add buttermilk, oil, eggs and vanilla and mix them properly. When done you can pour your wet ingredients over dry ones and keep mixing on low speed; gradually add coffee and keep mixing until everything is well integrated. Pour the batter into the two prepared pans, equally. Bake for 35 to 40 minutes or until the toothpick comes out clean; if you don’t know this test then stop baking now and forever. Let them cool in the pans for about 30 minutes then turn them onto a cutting board and give them another 30 minutes. 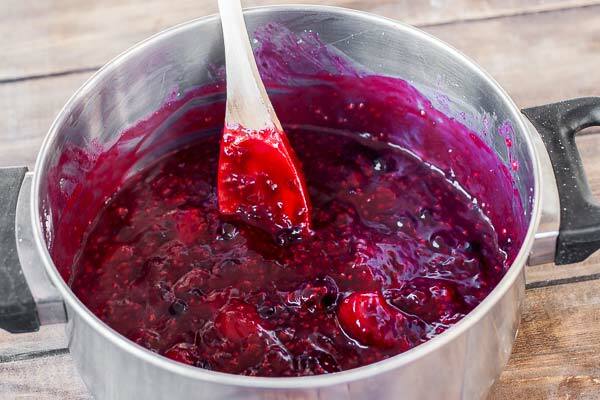 Filling is pretty easy to make, grab a bag of frozen berries 1½ lbs (675g) and throw it into a medium size sauce pan; add sugar, cornstarch and lemon juice. Cook over medium heat until the mixture thickens; continuously stir ot it might stick to the bottom. The whole process takes 5 to 10 minutes. For chocolate ganache, add heavy cream, chocolate chips and instant coffee to a small sauce pan and cook in bain-marie for under 5 minutes; stir occasionally. The white topping is made using cream cheese, whipped cream, heavy cream, confectioner’s sugar and vanilla extract. All you need to do is add them to the bowl of your mixer and mix until everything is very well incorporated; the mix should be thick enough that it’s spreadable. Right, cake assembly. Easy way, just cut each cake in two and here you go. If you want to go pro, use a long thin blade and cut each cake in three and start building your awesome desert. Using a nice big plate, add your first cake layer and a layer of fruit filling on top of it; continue with another layer of cake followed by a layer of cream cheese filling. Go on with another layer of fruit and another layer of cream cheese, that’s about four layers. At some point I got bored so I finished with the fifth layer of cake thing and we ate the sixth… it was pretty good. lol Now, before adding ganache, place your cake in the fridge for a couple of hours so that everything sets in nicely. After you fix those uneven edges spread ganache and get creative. 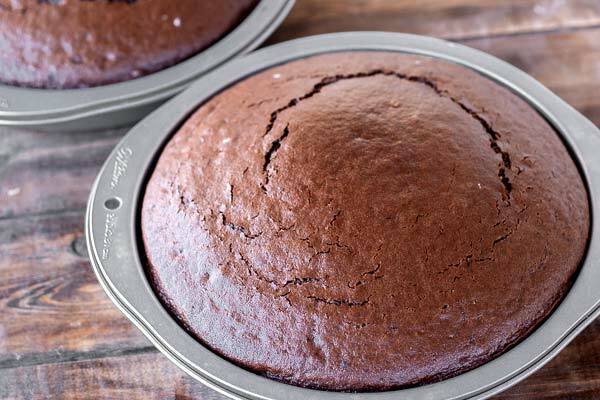 You will need 2 cake pans, each 8 inches (20cm) in diameter. Butter the pans using some melted butter then cut out two parchment paper circles and fit on the bottom, inside. In the bowl of your mixer, add the flour, sugar, cocoa, baking soda, baking powder and salt. Using the paddle attachment mix everything until well combined on low speed. In a medium sized bowl, mix together the buttermilk, oil, eggs and vanilla. Add the wet ingredients to the dry ingredients and mix. With the mixer still on low speed, slowly add the coffee and continue mixing until everything is well combined. Scrape the bottom of the bowl with a spatula and mix as needed. Pour the batter into the 2 prepared pans, equally. Bake for 35 to 40 minutes or until the toothpick comes out clean. Let the cake cool in the pans for about 30 minutes then turn them out onto a cooling rack or a cutting board and cool completely. Add the mixed berries to a medium size sauce pan. To it add the sugar, cornstarch and lemon juice. Cook over medium heat until the mixture thickens; continuously stir or it might stick to the bottom. The whole process takes 5 to 10 minutes. To assemble the cake, cut each cake into 3 pieces or 2 pieces, first cutting off the top part of the cake, so that the cake is even. On a plate, add the first cake piece, then add a layer of fruit filling, another cake piece, cream cheese filling, cake piece, fruit filling, cake piece, cream cheese filling, cake. Refrigerate the cake for a couple hours so that it sets. After is completely chilled, cut out the uneven parts from sides of the cake with a sharp knife. 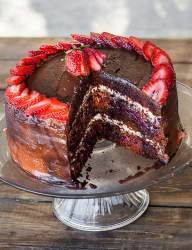 Using a cake spatula, spread the ganache evenly over the top and side of the cake. Top with sliced strawberries.